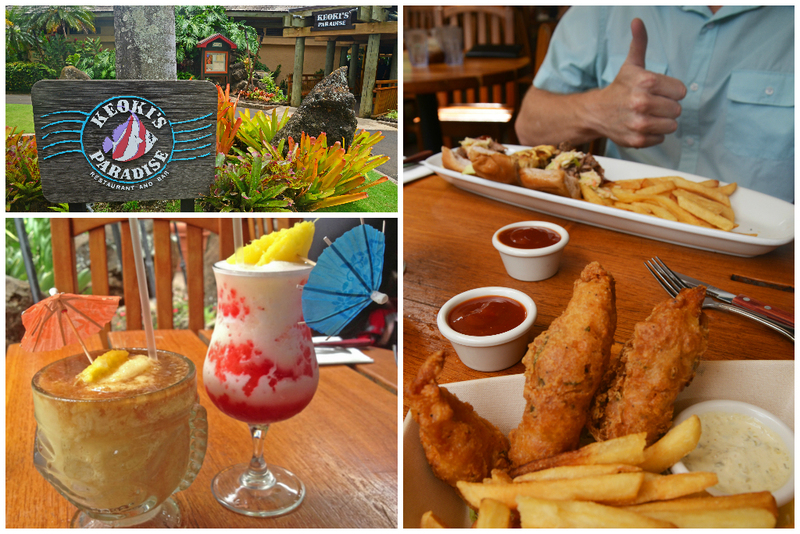 Our trip to the Garden Isle of Hawaii was made even better by the variety of delicious Kauai food (and drinks!) we encountered. 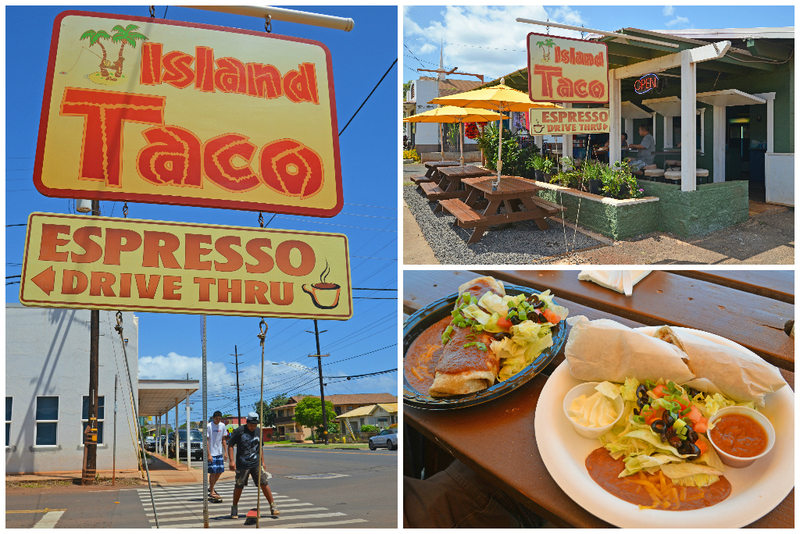 We set out to enjoy the best places to eat in Kauai and wanted to put together this list of recommendations for you, including quick bites, cafes, sweet treats, moderate budget, and fancy dining. 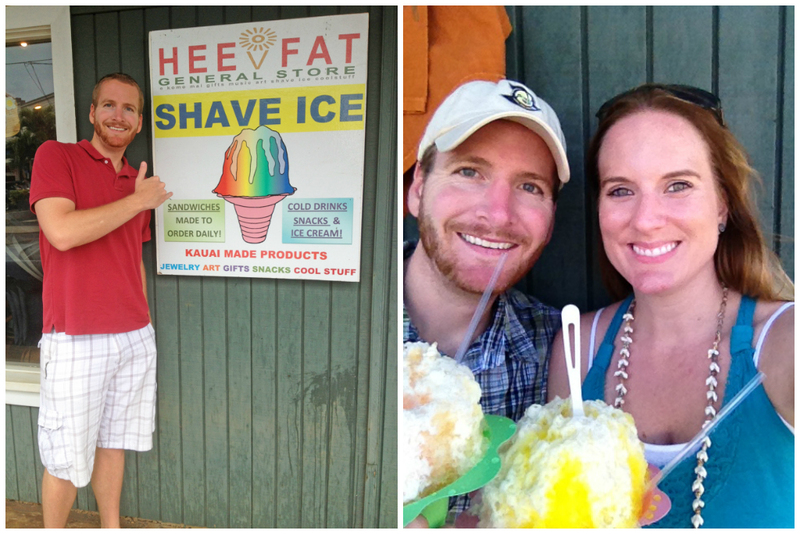 We’ll also let you know where to find the absolute best shave ice in Kauai! Warning: This post just might make your mouth water! Duane’s is a hole in the wall place with a lot of great reviews, so we figured it was worth a shot! The girl at the window completely messed up my order, but it was still tasty! I didn’t want to waste food by having them remake my sandwich, and each order takes about 15 minutes, so I wasn’t up for waiting any longer than I already had. Again, it was delicious nonetheless. Following our Kauai helicopter tour, we were starving! We didn’t want to eat right before take off in case we got a little nauseous during the flight, so we held off on lunch until after our super scenic adventure in the sky! We both ordered the ahi burrito, which honestly we could’ve split. It was a little lacking in flavor, but it was healthy and did the trick. Keep in mind, they only take cash, but there is an ATM in walking distance. 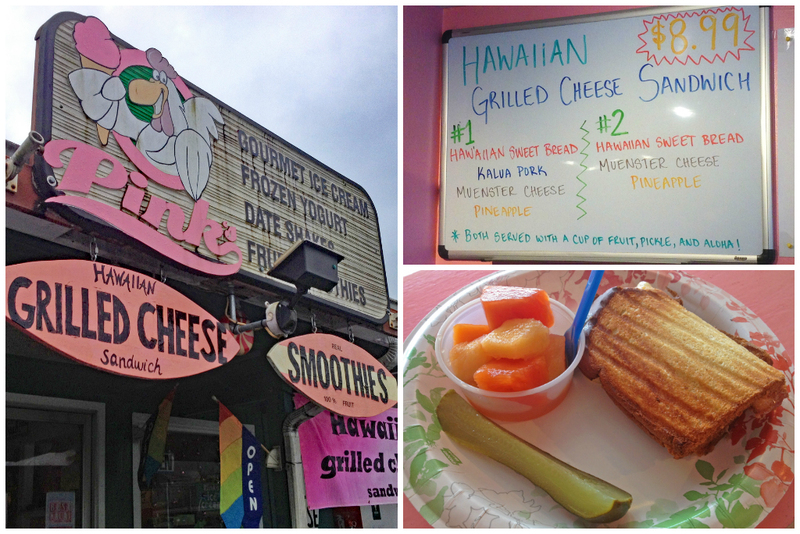 A sign caught my eye that said, ‘Hawaiian Grilled Cheese’. Yes, please! We had to check it out! It was a little hole-in-the-wall place in a strip mall called Pink’s. The grilled cheese sandwich consisted of muenster cheese (my favorite), pork and pineapple. The sandwich was yummy, but a little on the small side and you could barely taste the pineapple. I’m not sure it was worth the $9 we paid for it, but it was a great mid-afternoon snack. The food was so good here, we forgot to take a photo before we dug in! Sam ordered a burger wrapped in lettuce and I ordered a garden burger. Mmmm! Being from Southern California, we were having Mexican food withdrawals a few days into our trip, so we took a trip to Federico’s! 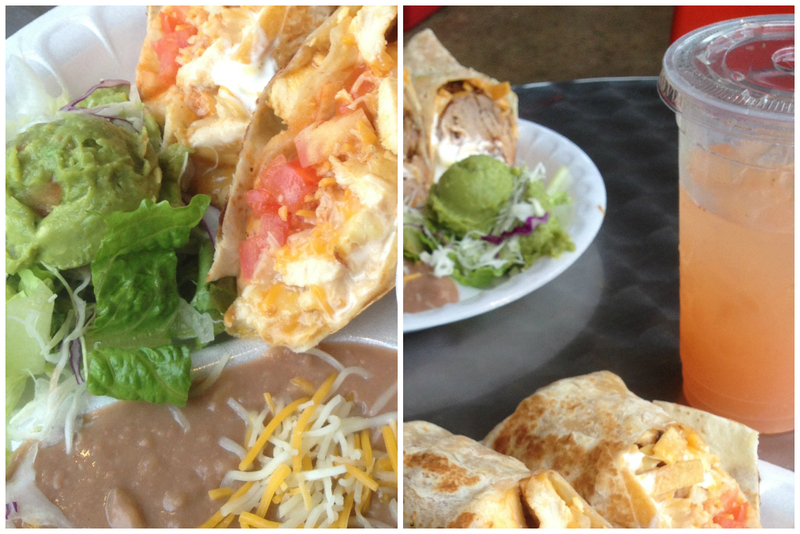 We both ordered the local favorite – a Mexican enchilada wrap with choice of meat (I had chicken; Sam had carnitas), queso cheese, tortilla strips, enchilada sauce, and guacamole, served in a toasted wrap with a side of rice and beans. It was quite delicious and definitely satisfied our craving! More Mexican?! Why yes, we hadn’t been steered wrong yet! A quick Yelp! search on my phone directed us to this tiny taco stand, which was located just a few miles from Waimea Canyon, one of the most beautiful places in Kauai. We both ordered burritos; Sam’s had carne asade and mine had teriyaki chicken. We ordered enchilada sauce to dip our burritos in, which was really good, but the salsa turned out to be even better! We certainly left full and satisfied! The open-air restaurant was cute and quaint and we got a seat right by the window overlooking a garden area with Hawaiian plants and rocks forming the shape of ocean waves. We started out with a sushi roll with ahi and crab to split. While it was meant to simply be an appetizer, it ended up being enough for our meal, so we skipped ahead to dessert and ordered the highly recommended ice cream pie with two spoons! Macadamia nut, banana and coconut ice creams layered onto an Oreo cookie crust drizzled in fudge and top with whipped cream… it was amazing! We ate every last bite! Keoki’s Paradise looked like a fun place to eat and based on prior research, the menu prices weren’t too outrageous. We were very happy with our decision to go there! We got to choose our seats on the open-air patio right by a little pond surrounded by tropical plants. Our dining experience started out with a frozen mai tai and a lava flow for pre-lunch cocktails. I had a hankering for the fish and chips and Sam ordered two BBQ pork sliders and a crab cake slider. We were both pleased with our lunch selections. 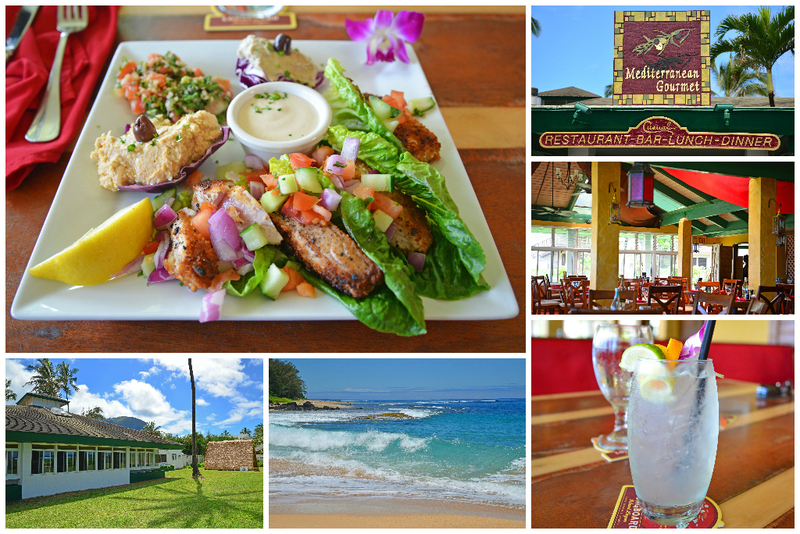 We had read multiple reviews that Mediterranean Gourmet was one of the best in Kauai cuisine and since it was located right along the beach, we were desperate to try it. We also knew it was fairly expensive, which is why we figured going there for lunch was best! Our lunch still ended up costing us over $60 USD, but we ordered drinks, a pupus (appetizer) and 2 entrees, so we knew it wasn’t going to be a cheap meal. The drink special sounded too refreshing to pass up – citrus vodka, citrus juices, and a splash of St. Germain! Following a scrumptious spanakopita as an appetizer, we then moved onto our main courses! I devoured macadamia nut encrusted ahi lettuce wraps, served with hummus, tabouli and babaganoush, while Sam enjoyed a hearty gyro wrap with waffle fries. We sure wish we had room to order some baklava for dessert, but by that point, we were stuffed… and very satisfied! UPDATE: Mediterranean Gourmet Officially CLOSED its doors in 2017. 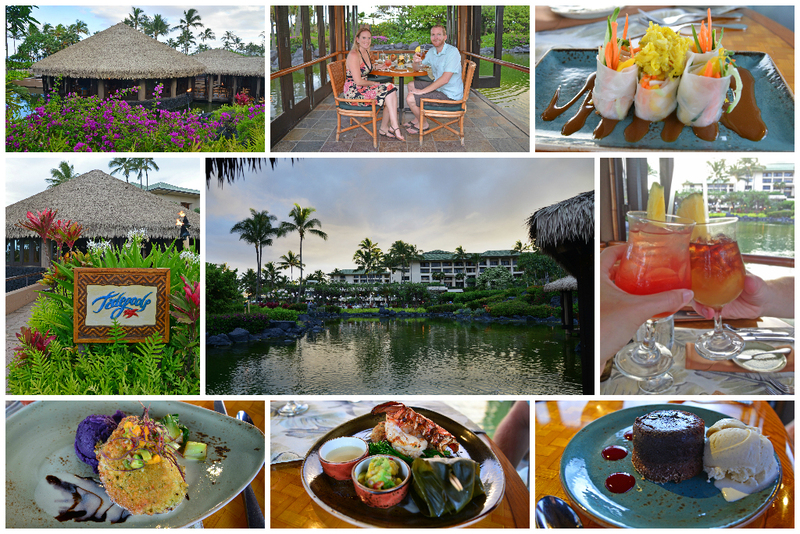 Our meal at Tidepools was so incredibly romantic and delicious, we put together a separate post about our most romantic dining experience ever! 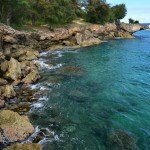 Many consider Tidepools to be THE best place to eat in Kauai! We had read that Hee Fat General Store was the best place on the island for shave ice, and since this was our first experience eating shave ice, we decided this would be where we’d try it! Sam asked the guy working the counter what the best combination of flavors was and he recommended mango, guava and passion fruit, so that’s exactly what he got. I ordered a combination of banana, coconut and pineapple. We both added a recommended scoop of macadamia nut ice cream to the bottom and went for the topping of a light drizzle of melted vanilla bean ice cream on the top. What an incredible first experience! I don’t know if we could ever have plain shave ice after that! 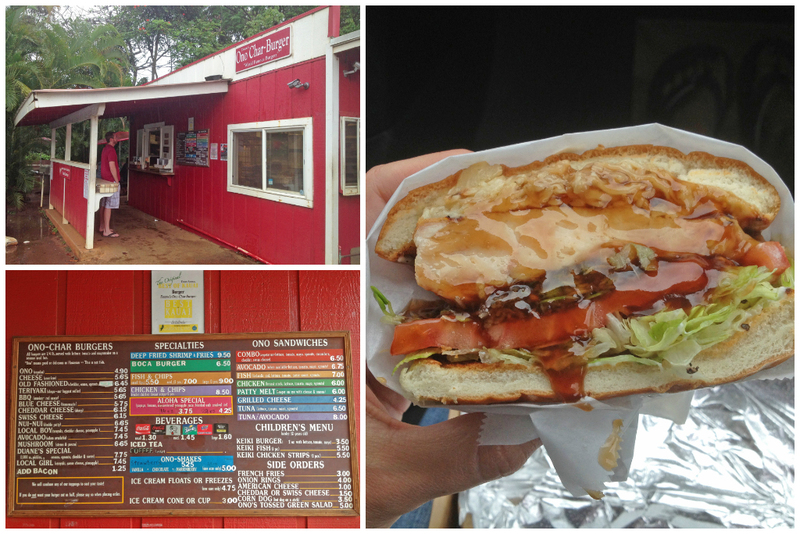 Needless to say, we made a few more stops to Hee Fat during our week in Kauai. 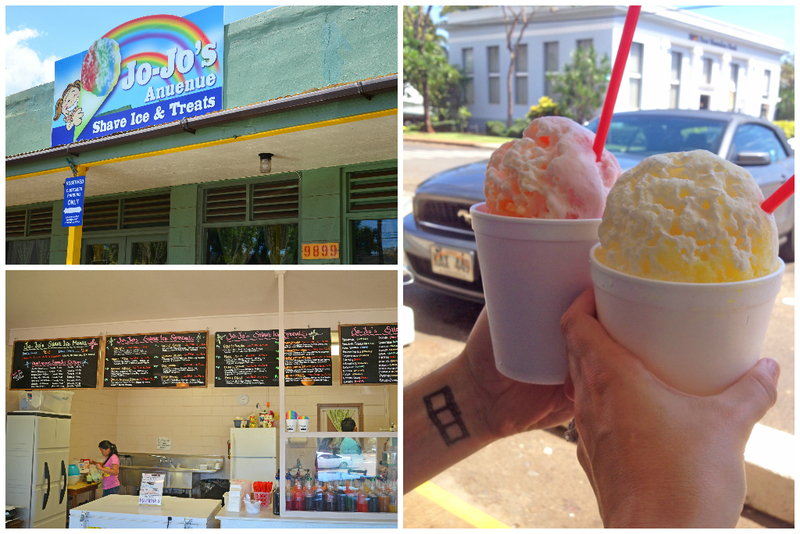 Jo-Jo’s is another raved-about shave ice establishment on Kauai. We were curious to see how it compared to Hee Fat. We’re pretty sure we ordered the same flavors that we did at Hee Fat, but this time instead of the melted vanilla bean ice cream drizzled on top, it was some form of coconut liquid. As far as how the two compared, Hee Fat’s shave ice was softer and easier to eat. Jo-Jo’s, although delicious and refreshing, had a little too much syrup for our liking. TIP: It is highly recommended that you rent a car during your stay on the island of Kauai. Public transportation is fairly limited and having your own car will allow you the freedom to go wherever you want, whenever you want… especially to the excellent restaurants we are recommending! We found a great deal on a convertible with Hertz. How can anyone resist yummy ice cream served in freshly-baked chocolate dipped waffle cones. We visited Lappart’s a few times during our week in Kauai. 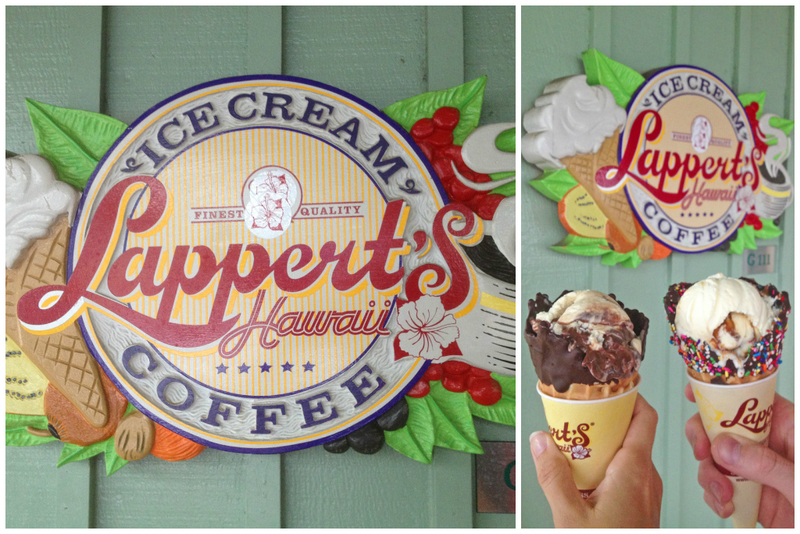 Throughout our many visits, we tried the peanut butter cup and fudge, caramel cashew turtle cluster, and Kauai Pie. All were divine! 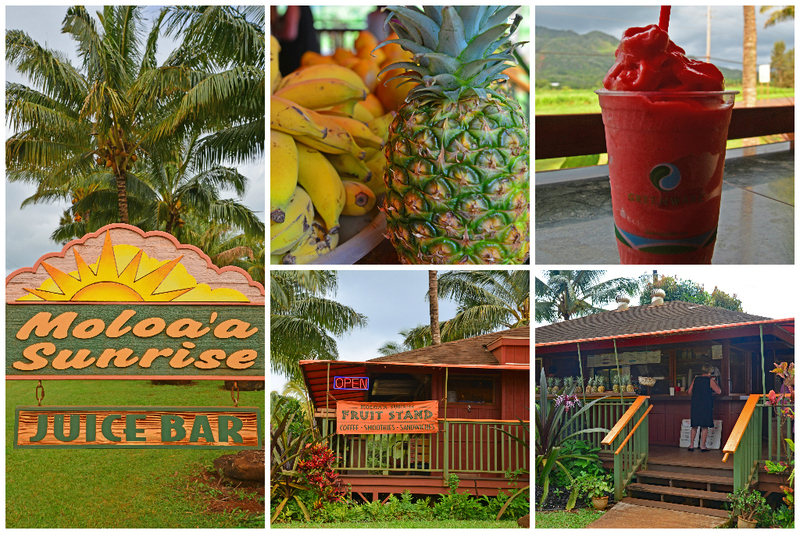 We had been eyeing the Moloa’a Juice Bar each time we drove past it, so we decided to check it out. The pineapple, banana, and strawberry smoothie was just as refreshing as it looks! 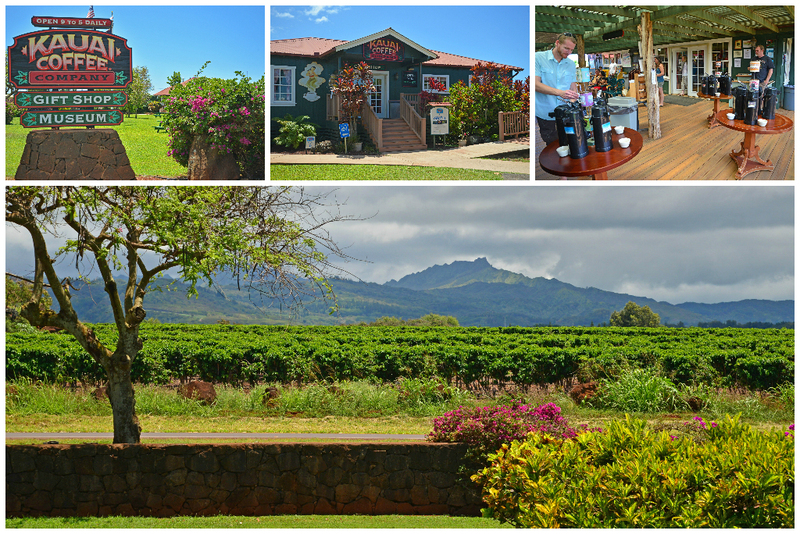 The Kauai Coffee Plantation is a recommended stop for coffee lovers. I personally don’t not drink coffee, so this stop was all for Sam! The surrounding area was absolutely beautiful, so I simply enjoyed the scenery while Sam enjoyed the coffee! The samples were free; his favorite was the coconut caramel crunch. We even bought a bag a fresh coffee in the gift shop to take back to his mom. 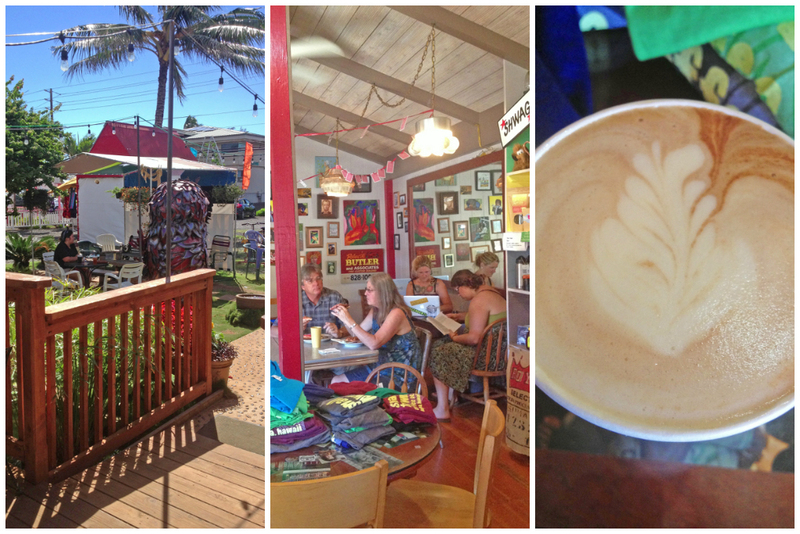 We had read about Small Town Coffee in a Sunset magazine article, so we had to check it out! Sam ordered a coconut mocha, which he said was delish! Attached to the coffee shop was a tiny used bookstore where Sam ended up finding and purchasing a (1941 copyright) copy of The Last Tycoon by F. Scott Fitzgerald for $3! 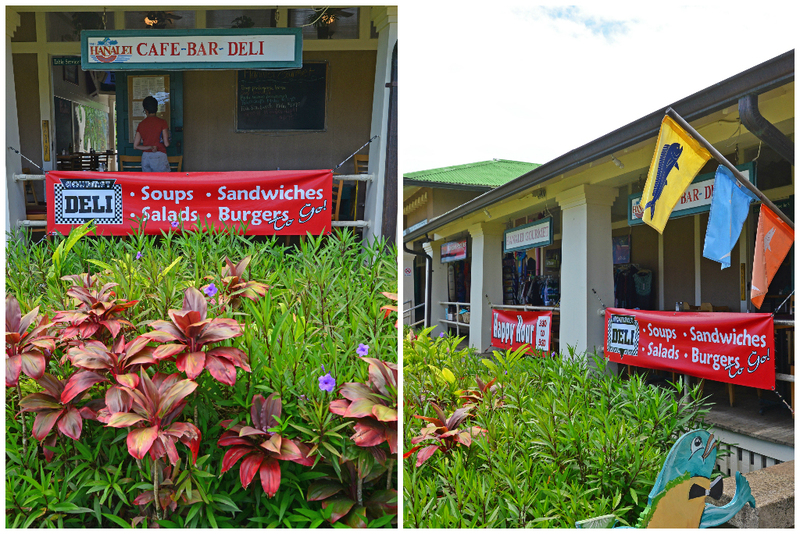 Hemingway’s Café is another place to stop for coffee in Kapa’a. We had a little bit of a hard time finding the Koloa Rum Company, because the GPS in our phone was a little off, but we eventually found the Kilohana Plantation where the Rum Company was located. They do tastings for a maximum of 16 people every ½ hour. The woman pouring the rum was very energetic and enthusiastic about the rum! It turned out to be more of a history lesson on the sugar plantation than it was about drinking rum. We sampled each of the 4 types of rum (only equaling one full shot), pouring a tiny bit of each into a separate shot glass with some juice to make a mai tai. To be honest, we weren’t really impressed with the rum. I imagine it would be better mixed with other ingredients, such as coke or in other drink concoctions, but the only one we really enjoyed by itself was the Kauai spiced rum. We bought a tiny bottle of the spiced rum and I, of course, bought my traditional travel shot glass. 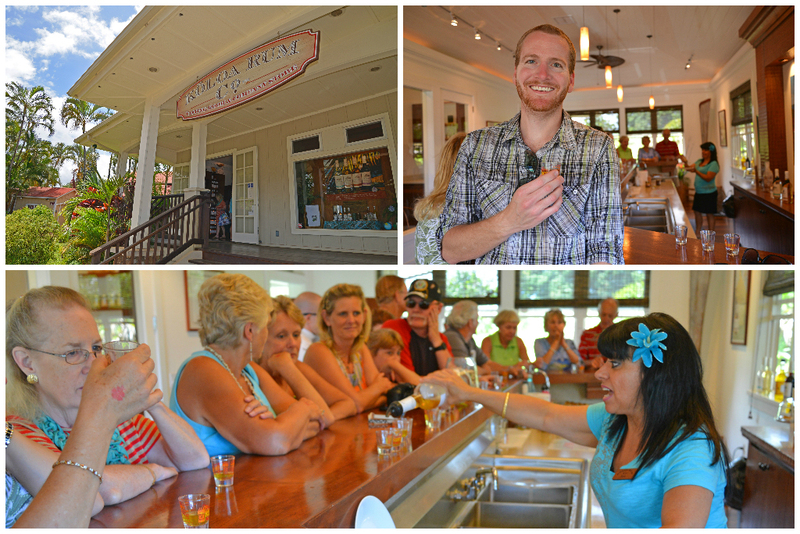 Not sure I would recommend the rum tasting experience to others, but it wasn’t a complete waste of time. So, if you’re really into rum, this might be right up your alley! Have you ever been to Kauai? 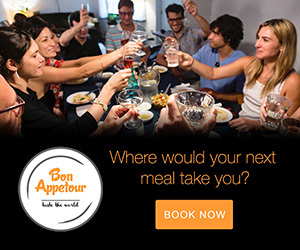 What restaurant would you recommend that wasn’t on our list? This post contains affiliate links. 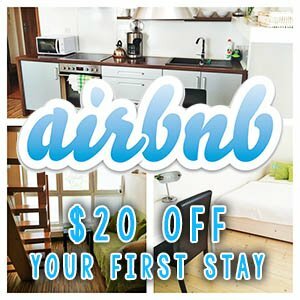 If you make a booking after clicking on one of these links, we may receive a small commission, at no extra cost to you. Wonderful blog! Lots of great information ?thank you ! Thanks for the great list of places. 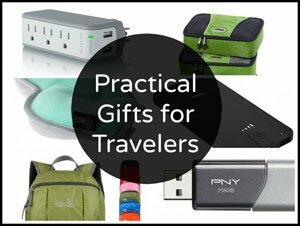 Looking forward to a trip coming up soon and this is so helpful! You’re welcome! Glad we could help. 🙂 Enjoy your time on the Garden Isle! As a resident of Kauai I enjoyed reading about your trip. If you come again I would recommend Duke’s, Hamuras Saimen ( true local experience and to die for lilikoi pie), Kilauea Fish Market, and Bubbas in Hanalei. Glad you enjoyed reading about our trip! We had such a wonderful time on the beautiful island! How lucky of you to live there! We tried to go to Duke’s, but it was packed inside and raining outside, so we skipped it. Next time, though! Thanks for the extra tips. I will certainly want to visit new and exciting places on our next visit. Thanks again for stopping by! Mahalo! I have eaten at several of these places. I especially loved your pictures! They are so beautiful and brought tears to my eyes! I love Kauai with all my heart! Awww… so happy I could remind you of your wonderful Kauai memories! I love reading your blog. We plan to make our third trip to Hawaii in October. Stops in Hawaii, Maui and Kauai during or 17 day trip. You share some of the same passions that I do. I taught photography for 35 years in high school and I must admit your photos are fabulous. I love taking photos to document my blog stories as you do. 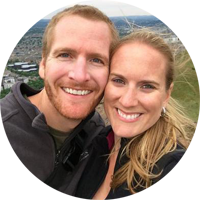 My wife and I have been traveling since I retired in 1999 and have been to Europe, Hawaii and most of the Caribbean islands. Great stuff for stories. I will have to go back and read all your stories and posts. I’m sure they’re going to be as much fun as this one was. Your big advantage over me is you started traveling much earlier than I did for you see, I’m more than twice your age. Enjoy your travels. You’ll never regret that you explored the world. You have to go to Tahiti Nui’s in Hanelai! Great pizza, steak and tuna. Mai Ti’s are the best on the island. Great music and watch for star, we have seen Beau Bridges twice. The movie Descendants was film inside! We’ll have to check that out on our next trip! Thanks for the tip! What an awesome and thorough blog! The hubs and I will be there next month (first timers) and I was thrilled to read about all the great places you experienced. I know our time there will be amazing as well and appreciate the tips that we can take with us! Next time also try Puka Dog in Poipu. As well as for a nice dinner The Beach House, expensive, but 1000x worth it. Tortilla Republic, also in Poipu, my hubby didn’t like it so much, but the Poipu Heat drink was amazing. I think I had 3 of them; good thing I wasn’t driving. 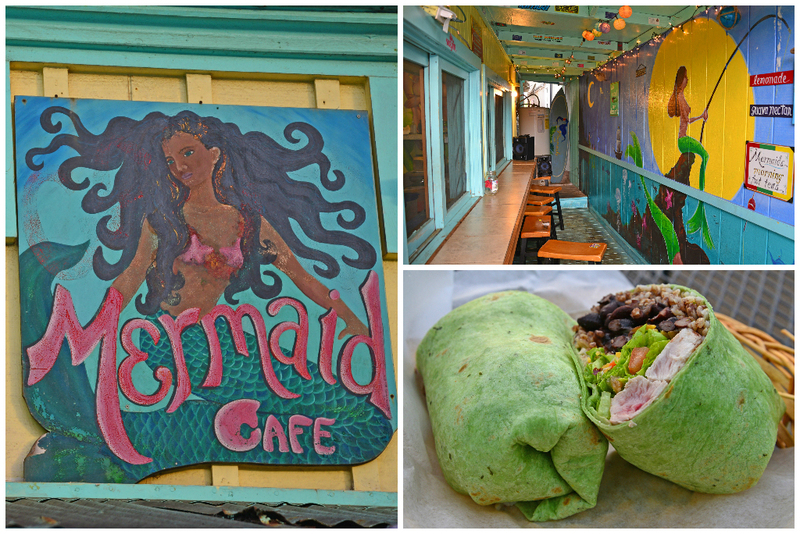 Brenekke’s (not sure of spelling) right at Poipu beach has a great surfers burrito and last, but not least, I think it was called Grinders right outside Port Allen, best Moca Loca! Small little hole in the wall dinner. Oh, we also spent a lot of time a Kalapaki Joes, great little bar. For a luau go to The Smith Family Luau forget the ones at the hotels theirs is on a plantation. Kauai is my favorite place on earth! Awesome! Thanks for the recommendations. I know we’ll make it back to Kauai in the near future, so I will certainly keep these suggestions handy. Thanks again! 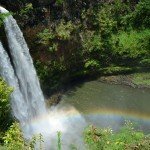 My husband and I are going to Kauai in two weeks and I’m so happy I found your blog!! Loved reading your blog! My husband and I love to travel and we absolutely LOVE Kauai. We have been there 3 times in the last three years and plan to spend a couple months there in July 2016. 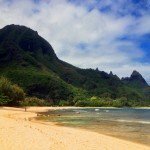 We are definite beach combers and foodies and found many secluded gorgeous beaches off the beaten path, my favorites being Moloa’a and Haena, to name a few…just breathtaking! 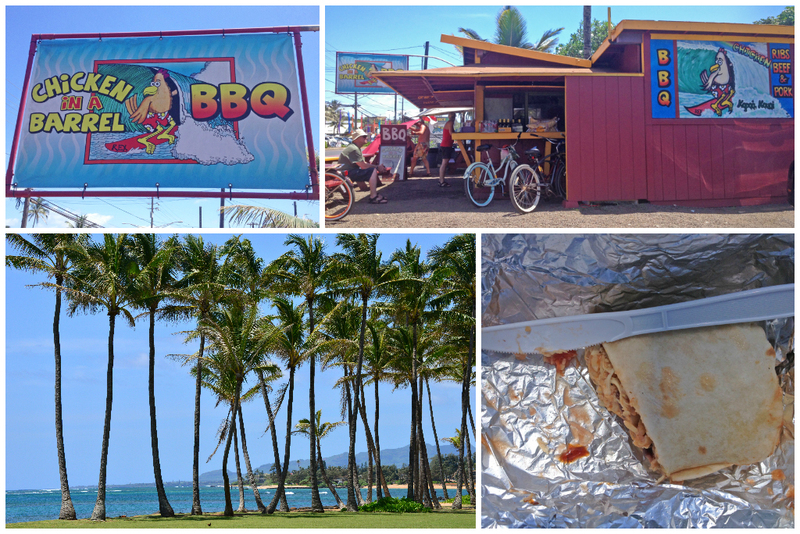 Some of our favorite places to eat were Oasis on the Beach and Hemingways in Kapaa and the food trailer in Hanalei for authentic Hawaiian food – delish! We frequently ordered ahi poke from the seafood section at Foodland and ate at home since it’s so pricey in Kauai. The poke is soooooo fresh and economical since ahi is easy to come by there. 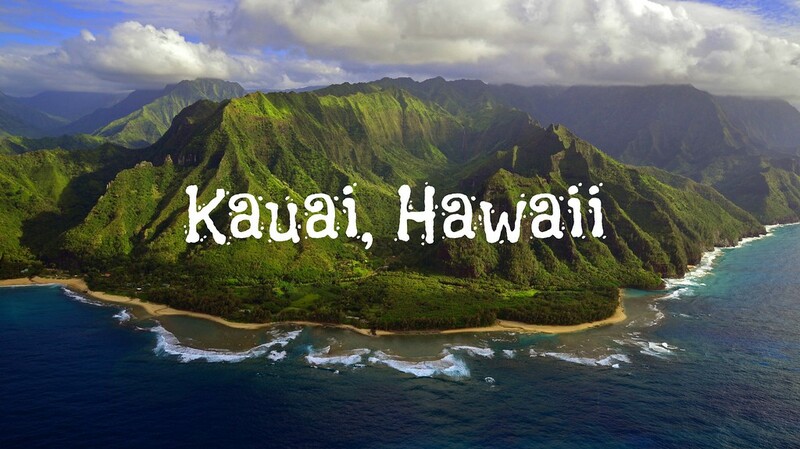 Anyway, we love Kauai and we plan to check out Mahaulepu next time – mahalo and aloha! It’s strange that you call these recommendations since you don’t speak so highly of some of the places you visited. We didn’t have absolutely terrible experiences anywhere. 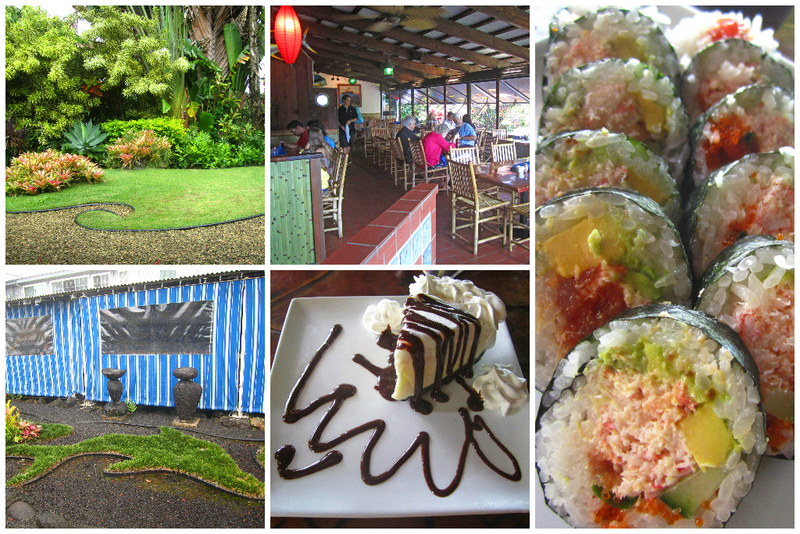 Some places we obviously enjoyed more than others, and we simply wanted to put together a post of places to eat in Kauai, based on where we ate during our week long stay. In our quest to remain transparent on our blog, we provide nothing but honest feedback of our experiences. Just because we weren’t necessarily impressed with a place, doesn’t mean someone else won’t enjoy it… that’s the beauty of reviews! 🙂 We’re simply providing options of places for people to try out, just as we did!